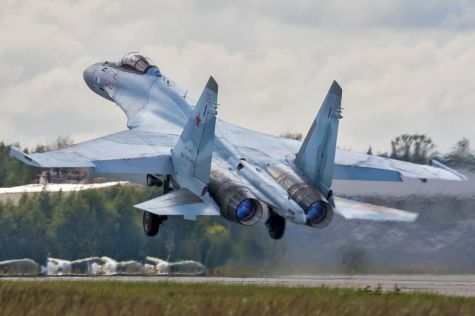 PARIS --- After decades of close political and defense proximity with the United States, the United Arab Emirates have concluded three major agreements with Russia which could lead to its air force being ultimately re-equipped with Russian combat aircraft. Announced Feb 20 at the International Defence Exhibition and Conference (IDEX 2017) in Abu Dhabi, the agreements include a framework MoU and two letters of intent on joint development of a sixth-generation fighter and the possible short-term procurement of Su-35S fighters. These agreements signal a weather change in the UAE’s military aerospace policies, which have historically acquired front-line combat aircraft from the United States and France, and could spell the end of France’s hopes of selling the Dassault Rafale to replace the UAE’s current fleet of Mirage 2000-9 fighters. To date, the UAE have only bought Russian ground weapons, such as BMP-3 infantry combat vehicles and Pantsir S1 air-defense systems, but the extension to military aircraft gives Russia a much more significant role in the defense of the Emirates. The framework agreement, described as an “agreement for co-operation in defence industries,” was signed on Monday by Homaid Abdullah Al Shimmari, CEO of Aerospace and Engineering Services, Mubadala Development Company, and Frolkin Aleksey Yevgenyevich, Deputy Director of Russian Federal Service for Military-Technical Cooperation. To illustrate the event’s significance, the signing was attended by Sheikh Mohamed bin Zayed Al Nahyan, Crown Prince of Abu Dhabi and Deputy Supreme Commander of the UAE Armed Forces, and Denis Manturov, Russian Minister of Trade and Industry. It “provides for procurement, development and partial manufacturing of advanced air, land and naval equipment to serve the requirements of the UAE armed forces,” the WAM wire service reported Feb 20. The level of publicity given to the event, however, could also be taken as a public warning given to the United States that both the agreement on Iranian nuclear program negotiated by the Obama Administration, and the pro-Israel signs given by the Trump Administration, of which the UAE disapprove, could have far-reaching consequences on the regional balance of power. The United Arab Emirates are interested in importing Russian-built Sukhoi Su-35 (NATO reporting name: Flanker-E) fighters, and talks on the subject are already in progress, TASS reported Russian Industry and Trade Minister Denis Manturov as saying at IDEX. "The Emirates have displayed interest in discussing the feasibility of Su-35 fighter deliveries. Detailed negotiations are under way, and we expect them to be fruitful," he said. The United Arab Emirates have signed a declaration of intent with Russia to purchase Russia’s Sukhoi-35 jets, Rostec Director General Sergei Chemezov said. He had first announced in 2015 that Russia and the UAE were negotiating on the Su-35, but nothing more had been heard of these talks. Any procurement of Su-35s would be financially significant, but still much more affordable than Western aircraft. In November 2015, a sale of 24 Su-35s to China was valued at $2 billion, including ground infrastructures and spare engines, which at current (real LRIP Lot 9) prices would barely cover the acquisition of a dozen Lockheed F-35s and their engines. The latest Su-35 (NATO reporting name: Flanker-E+) is a deeply upgraded, super-maneuverable multirole fighter which Russia describes as “4++ generation.” It features a new avionics suite that, according to TASS, is based on a digital information-management system, a new radar with long range of aerial targets detection and an increased number of simultaneously tracked and engaged targets, and higher-power engines with thrust vectoring controls. However, given the operational availability of Russian military aircraft, and Russian industry’s lack of responsiveness in the field of customer support, as evidenced by the Indian Air Force’s experience with the Su-30MKI, it is not clear that the UAE will actually improve their air defenses by switching to Russian combat aircraft. The most ambitious project under discussion if the co-development of a fifth-generation light fighter aircraft. "Today, we have signed an agreement on industrial cooperation in military hardware production. The agreement enables us to pursue a fifth-generation light fighter development program with the Emirates participating," Manturov said. United Aircraft Corporation (UAC) President Yuri Slyusar told TASS that the aircraft’s development is at the initial stage. "The co-development of the fifth-generation light fighter together with the UAE is at the initial stage. At present, we are preparing our proposals for the Emirates. We believe the aircraft will be a success. We are willing to unveil our developments to our [Emirati] colleagues," he said. According to Slyusar, the Russian participation in the program will be in the form of UAC as prime contractor, Sukhoi Company with its fifth-generation fighter expertise and the MiG Corporation with its expertise in single-engine planes. Yuri Slyusar stressed that the concept of the new aircraft was subject to working out. "We have not crafted a concept of the fifth-generation light fighter yet, have not chosen whether it will be single-engine or two-engine. However, the agreement allows starting the work on that," the UAC president added. The future fighter will be developed on the basis of MiG-29 as of 2018, according to Chemezov; development work is to begin “next year [and] it will take seven to eight years to develop."